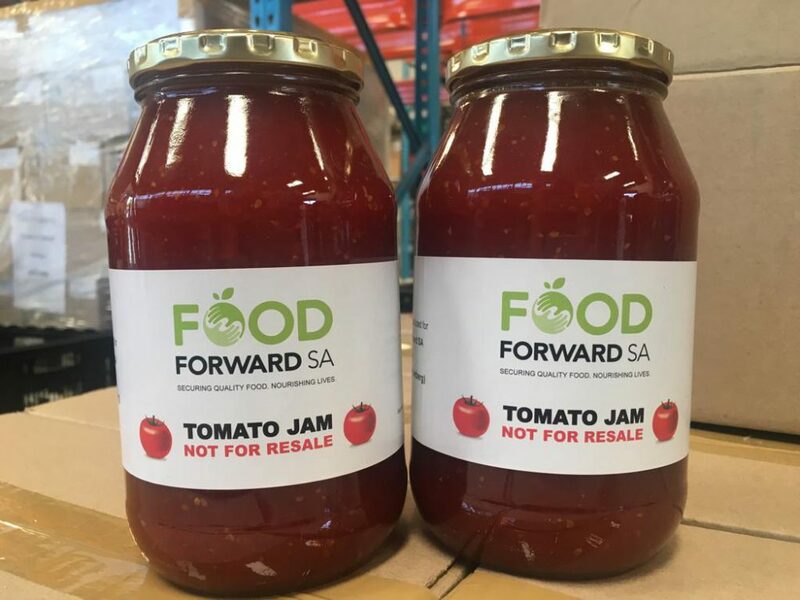 FoodForward SA beneficiary organisations across the country are in for a sweet surprise as the first-ever batch of FFSA tomato jam will shortly be distributed as an addition to the regular food basket offering, while stocks last. Faced with an oversupply of fresh tomatoes as a result of the success of our recently launched Second Harvest initiative, FoodForward SA took the opportunity to partner with a food processing business in Piketberg to turn more than 5 tons of tomatoes into jam, thereby offering a viable way to ensure that none of the agricultural surplus recovered through Second Harvest goes to waste. The jam is packaged in 990g glass jars, each of which is marked with a FoodForward SA “not for resale” label. “We opted not to sell the jam commercially but rather to introduce it to our beneficiary organisations as an addition to their monthly food baskets, so we chose a 990g jar over a smaller size because we serve organisations that feed sizeable groups of people.” said FFSA Managing Director Andy Du Plessis as the first few samples were introduced for taste testing at the national head office and the Cape Town warehouse. 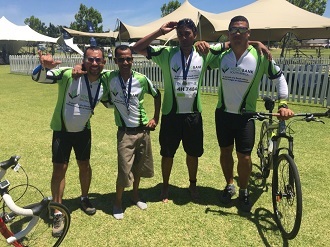 “We were delighted with the feedback on the initial samples presented to staff and beneficiary organisations. All who sampled the jam rated it highly acceptable for both taste and presentation.” he continued. Over 2000 jars of jam have been produced to date, and these will now be distributed to BO’s from our warehouses nationwide. Elle Williams spoke with Andy Du Plessis about the jam project. EW: How and why has FoodForward SA taken to producing jam? ADP: Our Second Harvest initiative was officially launched in January 2017. We launched the program based on research findings from several reports indicating that roughly 50% of global agricultural produce goes to waste. We saw an opportunity in line with our core business (which is the recovery and redistribution of surplus food), so we met with a few local farms, and did some fact finding regarding harvest times, volumes, and possible surpluses, to get a sense of the local context. Those interactions confirmed the research findings about the huge amounts of fresh food being wasted at the harvest stage here in South Africa. EW: Why is there so much agricultural waste? ADP: A number of reasons account for this – one being specification requirements. 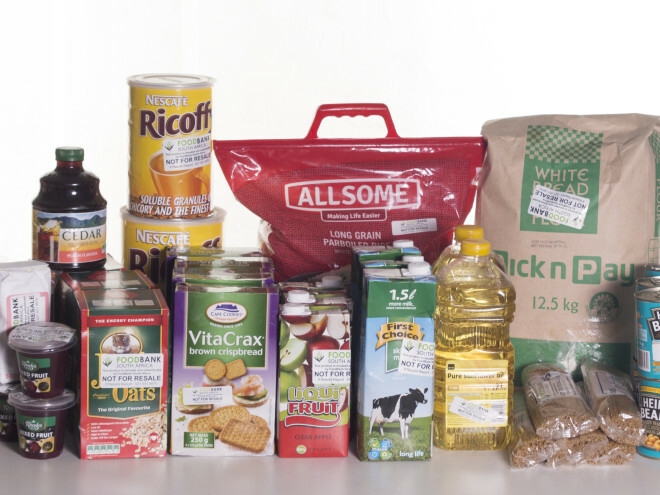 Retailers, wholesalers and manufacturers all set specifications on various attributes of the produce that they order, e.g. size, shape, etc. A farmer typically grows specifically for a particular retailer or wholesaler, and inevitably there is produce harvested that falls out of spec, so sadly, it ends up in landfills. Another reason may be that while a retailer might require a specific volume per week of a product, a farmer can’t predict how much will be harvested at any one time – the harvest may yield more units in that week, which cannot be sold. EW: Well that’s a clear opportunity for a win-win. ADP: Exactly. It was obvious that there was room for a shared value arrangement between us and the farmers, and that is how our Second Harvest programme came into being, starting at the beginning of 2017 with just a few farmers, and funding support from the Pepsico Foundation in partnership with the Global Foodbanking Network (GFN). So we collect agricultural surplus, bring it back to our warehouses, sort it and then distribute it as quickly as possible to our beneficiary organisations because fresh produce has a very limited shelf life. But after we started the project we quickly realised that there may be a secondary opportunity and a problem that needed to be mitigated against. The issue was that, even after distribution to beneficiary organisations, there was sometimes still surplus left over, especially tomatoes, kiwis etc., and of course this produce is highly perishable. Because we are not in the business of wasting any food, we decided to look into food processing alternatives that would allow us to turn perishable surplus food into shelf-stable products. We knew that we would need to partner with manufacturers to process the food on our behalf, so we started talking to our retail partners. Woolworths introduced us to FruitLips, one of their manufacturers, which happens to make jam. The company is based in Piketberg and employs 30-40 women. We met with them, and established that they could do what we required at preferential rates if we had sufficient volumes. Shortly thereafter, we received a huge load of surplus tomatoes from Rennies, who are also a Woolworths supplier, and after distributing the tomatoes to our BO’s, we realised we had so much left over that we could produce a few tons of tomato jam. So that’s what we did – we got the product to FruitLips directly from the farmer, and it took them about 3 weeks to produce the tomato jam. EW: I know that the jam has been very well received – so much so that people are wondering when they can expect the next batch! ADP: That is encouraging, but it’s important to note that this is not an ongoing initiative on our part – it simply gives us a way to ensure that regardless of the volume, the produce that we recover doesn’t go to waste. We can’t predict if and when we will produce more jam – that depends on the kind and quantity of fresh produce we receive from our farmers, but we are happy that this pilot project has been successful and we now know that we have a viable alternative to distribute surplus agricultural produce at scale.